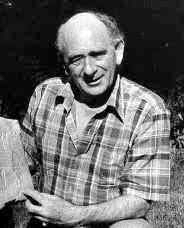 "Barry Fell (born Howard Barraclough Fell) (June 6, 1917 – April 21, 1994) was a professor of invertebrate zoology at the Harvard Museum of Comparative Zoology. While his primary professional research included starfish and sea urchins, Fell is most well known for his controversial work in New World epigraphy, arguing that various inscriptions in the Americas are best explained by extensive pre-Columbian contact with Old World civilizations. His writings on epigraphy and archaeology are generally rejected by those mainstream scholars who have considered them."